There are only two inscription ever discovered that specifically mention 12/21/2012. One is known as Tortuguero Monument 6, the other was discovered in 2012 at La Corona. In both cases, the authors of these texts are more concerned about events of their time, than with predictions about the future. 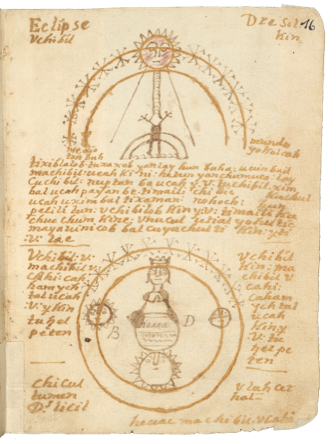 In the case of La Corona, the inscription sets the difficulties faced by the recently defeated Calakmul king Yuknoom K’ahk’ into a larger and more stable cosmological framework. According to Dave Stuart who deciphered the text, “This was a time of great political turmoil in the Maya region and this king felt compelled to allude to a larger cycle of time that happens to end in 2012,” says Stuart. The 2012 reference in the Tortuguero monument is used in a similar way. These texts show that when times were tough, the ancient Maya used their calendar to demonstrate and promote continuity and stability. If anything they were trying to tell their people that it wasn’t the end of the world. Ironic isn’t it, given the apocalyptical hysteria that was a huge part of the 2012 phenomena in our times. What about the Chilam Balam prophesies? The Book of Chilam Balam of Chumayel dates from the 18th century, (250 years after the Conquest). And it was written long after the Maya had abandoned the Long Count Calendar. Moreover, these books have been copied over and over by the Maya and the result is a book riddled with errors, inconsistencies and foreign influences. The Chilam Balam books contain prophesies that apply to 20-year periods that repeat every 256 years. Therefore the prophesies for 1992 to 2012, also apply to the twenty year period between 1736 and 1756, and the twenty year period between 1480 and 1500. The prophecy for all three of these eras are the same: "The quetzal shall come, the green bird shall come. Ah Kantenal shall come (kante is a species of tree, source of a yellow dye). Blood-vomit shall come. Kukulcan ("Feathered Serpent" = Quetzalcoatl) shall come with them for a second time. The word of God. The Itza shall come." Ok it’s vague and the thing about blood vomit doesn’t sound so good. However, as far as they go, it’s actually one of the better prophesies, as most of the predictions in the Chilam Balam are very bad. In other periods they predicted: "Harsh tidings", "locusts, fighting," evil and drought, "no lucky day." So in the scheme of things, 2012 wasn’t so bad - at least as far as the Maya predictions are concerned. 2012 - frequently asked questions: Mark Van Stone provides insightful answers. A brief history of the apocalypse: 2012 is just another point in a line of doomsday hysteria. Did the Maya calendar end in 2012? Talk to many people these days and they seem to take it as given that the Maya calendar ended in 2012. But if you ask them HOW they know that to be true - you probably won’t get a plausible answer. The fact is, that despite all the millions of web pages and hundreds of books written on the subject, the notion that the Maya Calendar ends, is based on a mistaken interpretation of Maya inscriptions from a time when archeologists couldn’t read the Maya glyphs. 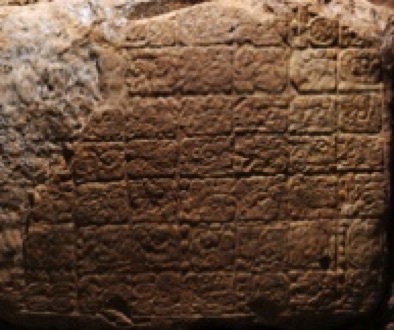 Now that archeologists can read almost 80% of the glyphs - it’s clear that the Ancient Maya had no expectation that the Long Count Calendar would end. 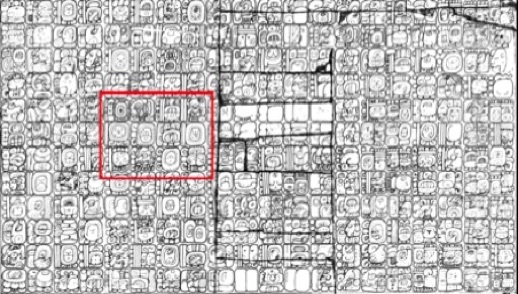 On the back wall, inside the Temple of the Inscriptions (the tomb of King Kinich Janab Pakal) is the longest intact Maya inscription ever discovered. It goes into some detail about Palenque’s history, but focuses on what occurred under the leadership of King Pakal. The text links Pakal’s coronation date to the 10 baktun Period‐ending, which at that time was 137 years in the future. It also links the coronation to an event some 1.2 million years before. The most interesting thing however, is that (in the red square above) it links the coronation to a point which is 20 Bak’tuns (a Pik’tun) plus eight days in the future which corresponds to 4772 AD in our calendar - 2760 years AFTER 2012! It is very clear that they did they not expect the calendar to end, or even restart, just continue as normal. Of course, the ancient Maya would have thought that reaching the date 13.0.0.0.0 was a very important period ending (it’s the end of a Bak’tun - a 400 year cycle). But not just any period ending, this one would be loaded with overtones of their creation date. It would be party time. What did the Ancient Maya say about 2012?